Eden Hazard has raised hope concerning his Chelsea future and also want to know if the fans want to see him leave. Chelsea are fifth on the league table and winning their last two matches might see them book a place in next season's Champions League. Well, it also depend on the result of both Liverpool and Tottenham games. 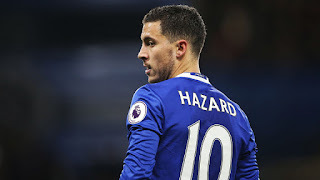 If Chelsea fail to book their their place in the Champions League, Real Madrid might use the oppourtunity to lure Hazard to Madrid. Though Hazard also review in his interview that playing in the Champions League is not a priority. Chelsea will also look to keep Willian in the Club as Manchester United are doing everything they can to bring the Brillian to Old Trafford. Do you want Hazard to remain at Chelsea?